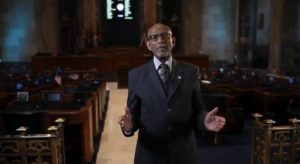 BATON ROUGE — A Louisiana state senator released a video this week explaining why he made the ‘bold decision’ to change his party affiliation from Democrat to Republican. In his four-minute presentation, Senator Elbert Guillory outlined his belief that the Democratic Party rather seeks control of society instead of granting true liberty to the American people. Guillory, a Roman Catholic, then chronicled the contrast between Republicans and Democrats throughout history, explaining that Republicans authored the 13th, 14th and 15th Amendments to the United States Constitution. “It was the Republican President Dwight Eisenhower who championed the Civil Rights Act of 1957, but it was the Democrats in the Senate who filibustered the bill,” he said. The state senator then pointed to what he perceives as the failed policies of the Democratic Party. “Our self-initiative and our self-reliance have been sacrificed in exchange for allegiance to our overseers who control us by making us dependent on them,” he opined. Guillory concluded his talk by posing that perhaps our nation has devalued the meaning of freedom until it is now merely a cliche. The senator then called upon others to follow in his footsteps by turning from the Democratic party. “So, my brothers and sisters of the American community, please join with me today in abandoning the government plantation and the party of disappointment,” he said. As previously reported, Bishop E.W. Jackson of Virginia delivered a similar proclamation during the 2012 presidential election.